Metso to increase its foundry capacity in India to meet the growing global demand for cast wears for mining and aggregate industries. Metso is investing in the development of its foundry capacity in Vadodara, India. The initial investment includes the acquisition of the property and foundry assets of a privately-owned foundry project, Mega Cast. Metso expects to invest a total of approx. EUR 25 million to purchase the assets and to develop the foundry by 2020. 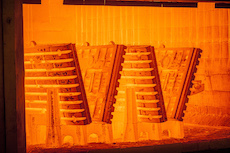 With this investment Metso is responding to the global market demand by increasing production capabilities in cast wear parts for the aggregates and mining industries.